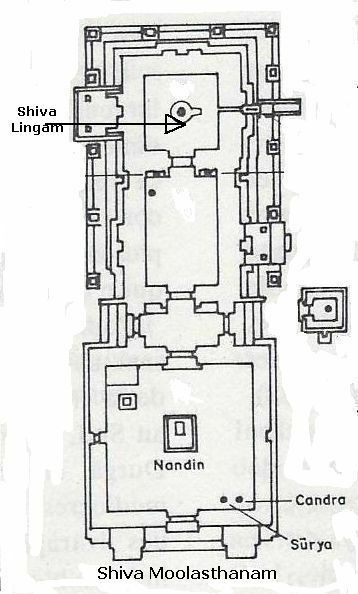 The arrangement of the Asta Lingams around the octagonal perimeter of Arunachala reflects the geometry of a Cosmogram. The octagonal shape is surrounded by a total of eight Lingam Temples (Asta Lingams). Each of these Temples are located at the four cardinal and four inter-cardinal points. This was also believed by the ancients who originally constructed the Lingams at their eight cardinal and inter-cardinal points to represent, characterise and vitalise certain aspects and qualities of life in relation to specific fields of energy and influence. The Lingams have the dominant Navagraha of the God to whom they are associated. It is believed that placating a specific Lingam will bring various benefits that are associated with the respective Navagraha. As well as the Asta Lingams which I have given details of in the above link, there are two additional Lingams on the girivalam roadway which according to the oral tradition of the region are part of what is considered the “Dasha Lingams” of Arunachala. Those two additional Lingams are the Chandra Lingam and the Surya Lingam. My previous post gave information and photographs of the Chandra Lingam, and this posting is about the Surya Lingam located on the Arunachala Girivalam Roadway. There is a vast amount of mythology in connection with Lord Surya at Arunachala which I have written about in my Arunachala Grace Blog. In ths regard to view a fascinating post of the Surya-Arunachala mythology, go to this link here. 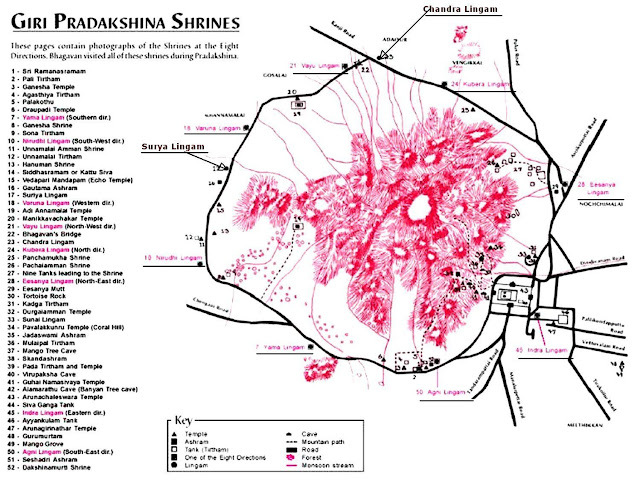 Its interesting to note the juxtaposition of Chandra and Surya Lingams in the map (above) of the Pradakshina Shrines to the map (below) of Arunachaleswarar Temple’s Moolasthanam, where the lingams are next to the Pradosha Nandi at the entrance to the inner shrine. Oral tradition reports that the similarity of the juxtaposition of Surya and Chandra Lingams at the gateway of the Lingam of Arunachala Hill and the Shiva Lingam at Arunachaleswarar Temple’s Moolasthanam, was created intentionally. 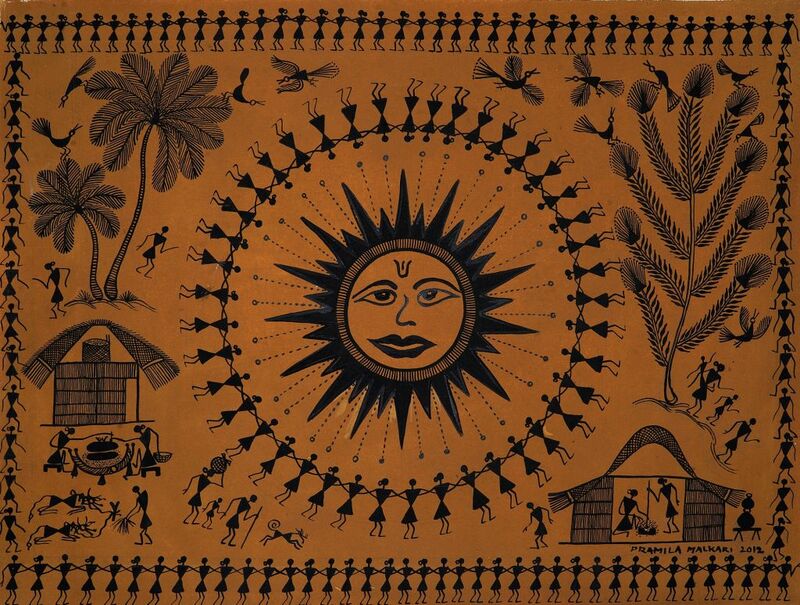 Surya, the Sun, is God incarnate in solar form, a glorious, shining golden visible every day. He is Astamurthi, one of the eight forms of Shiva. The Sun alone is the pivot of the entire Universe, the dispeller of darkness, and root cause of the three worlds. 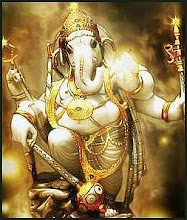 He is the deity of great brilliance and is considered the Supreme Soul. There are many names of Lord Surya and each name refers to a quality of consciousness; Aditya, Savita, Surya, Mihira, Arka, Prabhakara, Martanda, Bhaskara, Bhanu, Chitrabhanu, Divakara and Ravi. 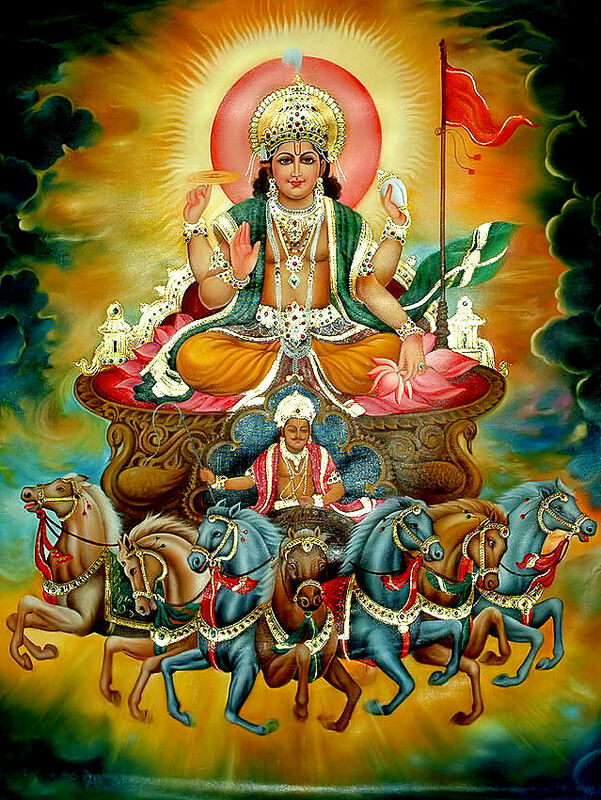 Surya is the chief of the Navagrahas and is often depicted riding a chariot harnessed by seven horses which represent the seven solar rays, the seven chakras of the body and the seven days of the week. Surya's sons, Shani and Yama are responsible for the judgment of human life. Shani provides the results of one's deeds during one's life through appropriate punishments and rewards while Yama grants the results of one's deeds after death. In Vedic astrology Surya is considered a malefic on account of His hot, dry nature. Surya represents soul, will-power, fame, the eyes, general vitality, courage, kingship, father, authority figures, benevolence, generosity, grandeur, dignity, and friendliness. In Tantra yoga, Surya, the planetary deity of the Sun, represents the universal male principal, while Chandra, the Moon, represents the universal female or shakti principle. Surya is also associated with Agni, the god of fire. Moopanar Swamigal who was responsible for the restoration of the Ashta Lingams at Arunachala, did not have anything to do with restoration work at either the Surya or Chandra Lingams. Surya Lingam is located after Gautama Ashram and before Varuna Lingam on the leftside of the Girivalam Roadway. 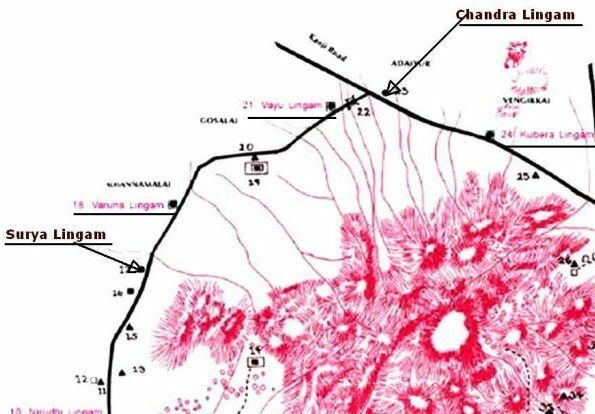 Including two buildings connected to Lingam priests, the area on which Surya Lingam is situated on less than 1/2 an acre. In 2016 renovation work financed by a family in Chennai, was completed at the Lingam. I hope to post more information about this Lingam shortly on my Arunachala Samudra website. It seems when we have more information about something it increases our understanding and connection to it. Definitely researching the posts I write on my blogs helps deepen my relationship with Arunachala.